“I eat a healthy diet”. As a Chinese medicine practitioner, I hear this statement often in response to questioning patients on their food choices. But what is a healthy diet? You might be surprised at the answer. For a Chinese medicine practitioner, a traditional ‘healthy’ diet is very different than the modern food choices recommended on television and in magazines. The Chinese Medicine diet is based on energetic principles to encourage balance, clean burning digestion, and a well functioning body, free of disease and full of energy. Patients who make the switch get faster results than patients who don’t! Waistlines shrink, allergies clear, sinus issues become a distant memory, and acid reflux is relieved. These are just a few of the many conditions that respond to acupuncture when combined with dietary therapy. In my twenty years as an alternative medicine practitioner, I’ve gained valuable experience guiding patients through making dietary changes that restore them to health quickly and effectively. This article covers some basic principles that will help the majority of people eat in a more balanced way, but does not paint the full picture of Chinese Medicine dietary therapy. Chinese Medicine dietary therapy is a complex practice that identifies and treats the underlying patterns of imbalance that are driving your symptoms. Yet, every human body has some basic requirements in common and Chinese Medicine dietary therapy starts with these basics in mind. It is my intent to help you choose more balancing foods based on these common energetic principles so you can create a foundation for healthy living. Eating for balance has been a way of life for the Chinese for thousands of years. The concept of balance is ingrained in their cultural choices of what to eat and when to eat it. The Chinese diet includes well known spices such as ginger and common foods such as pearled barley. Ingredients are chosen for their medicinal value, as well as for nutrition and taste. The Chinese have long known that ginger helps with digestion and barley helps to drain dampness. Choosing herbs and spices that encourage proper digestion is easy to understand. But the Chinese diet aims for another principle unfamiliar to most Westerners, and that is: draining dampness. Accumulated dampness clogs organs such as the lungs, causing allergies or asthma. When it clogs the digestive tract, indigestion or bowel problems can develop. Damp can also be ‘hidden’ and block meridians (the channels we use in acupuncture treatment that carry life force) leading to pain and stiffness or even swollen joints. Over time, dampness can become warm and create the diseases of inflammation such as diabetes, high cholesterol, and high blood pressure. Understanding and addressing dampness is one of the keys to treating disease in Chinese Medicine. Because it is so difficult to remove once it has accumulated, you can see the importance of not letting this dampness develop in the first place. How do we choose foods that prevent dampness, facilitate good digestion, and allow free flowing energy? Here’s where the wisdom of selecting foods based on their energetic properties comes in. This is simpler than you may imagine. Foods that can be found in any grocery store form the foundation of the healthy Chinese Medicine diet. What types of food does the Chinese Medicine diet recommend? Think of the typical menu you’ve seen in Chinese restaurants. The meals are built around steamed rice, cooked vegetables, and small quantities of animal protein or beans. In higher quality Chinese restaurants, the amount of cooking oils used will be low. 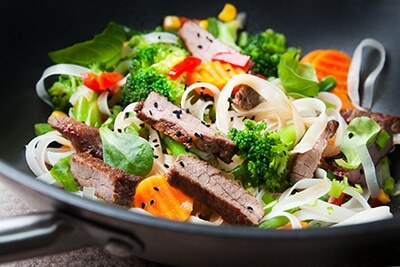 If you skip the deep fried choices and those made with flour products (think dumplings and wheat noodles), you have the basic Chinese Medicine diet – a diet that has been created to maintain balance in the body at any age. Have you ever noticed the quantity of vegetables on a typical plate of Chinese food? You are usually served a heaping plate of lightly cooked vegetables when you order a dish that includes vegetables in a Chinese restaurant. Vegetables play a major role in draining dampness and are packed with life giving nutrition. A variety of colors and textures create a combination that is both pleasing to the eye and to the palate. Taste and texture plays an important role in regulating appetite. A wide variety ensures satiety, so you feel full. Varied colors provide a broad array of nutrients and antioxidants to promote health and longevity. Your plate should begin with a large quantity of lightly cooked vegetables. A good guideline is to fill half your plate with vegetables. You will want to include lots of leafy greens as these are one of the most balancing and nutrient dense foods you can eat. Rice is a balanced food which is easily digested. In my allergic patients, rice is the number one hypo-allergenic food I recommend to help them with their symptoms while undergoing allergy treatments because it is so gentle to the digestive system. White or brown rice are interchangeable depending on which one digests most easily for you. White rice tends to be more cleansing while brown rice is considered more nourishing. Rice is a ‘clean burning’ food in Chinese Medicine which also gently drains dampness from the body. Rice should fill one quarter of your plate. Small quantities of animal protein or beans are included in the Chinese diet. The animal proteins are ‘building’ foods and can be difficult to digest hence the emphasis on ‘small’. A serving size of animal protein is typically 2-4 ounces 3-4 times per week. Beans can be eaten more often as they absorb dampness and provide fiber and protein. Your protein choice should fill the other quarter of your plate. One food you won’t find on the Chinese Medicine diet is raw, cold food. This includes salads and chilled food, iced drinks, and frozen foods. Cold, raw foods are culprits in the formation of damp because it is difficult for your body to process them. In order for your digestive system to extract the essence of food, it must ensure the food is approximately body temperature before it can begin breaking it down. Heating the food inside your body strains your energetic resources, weakening your energy system over time. Lightly cooked vegetables and well cooked grains allow your digestive system to immediately begin extracting energy without first having to heat the food to body temperature. Even though raw foods such as those found in salads contain slightly more enzymes and nutrients, the net gain is less than that of cooked vegetables as you lose energy to the internal heating/cooking process while trying to assimilate these foods. Notice that there is no cheese, butter, or milk on the Chinese menu. One of the reasons is the tendency of these foods to create dampness. Even if heated, dairy’s energetic nature is cold and hinders digestion. Chinese Medicine considers dairy to be a building food, only suitable for undernourished people. This makes dairy very stagnating if you are already well fed. In a culture concerned about calcium, we have been led to believe that dairy is the only source of this bone building mineral. This is far from the truth. Foods such as almonds, salmon, leafy greens, and broccoli are high in calcium and other minerals that are equally important in the formation of strong bones. Your calcium needs will be easily met by eating several servings of vegetables per day and adding small servings of salmon and almonds to your diet each week. Concentrated sweets – like soda, candy, sweetened yogurt, and energy bars – quickly create damp and are greatly over eaten in the modern diet. The flavor of ‘sweet’ is considered nourishing in Chinese dietary therapy. The majority of foods on the Chinese diet are primarily sweet. By sweet, the Chinese mean rice, animal protein, and vegetables, not concentrated sugars. If vegetables are considered sweet, you can imagine the intense sweetness of a piece of chocolate cake. The sweet flavor of rice, meat, and vegetables benefits the digestive organs. Concentrated sweets such as sugar impair the body’s ability to transform food into energy and to transport the wastes for elimination. Incompletely transformed food becomes dampness, accumulating over time to produce blockage and disease. One of my favorite herbal educators, Bob Flaws, says that the modern diet is a ‘recent aberration in the history of the human diet’ that has only developed over the last 50 years. Many modern food choices would not exist in the absence of fast global transportation and indoor refrigeration. If you think about it, humans evolved eating what was locally available and in season. Preservation methods evolved but these methods usually involved cooking. The modern grocery store is like having an in season garden all year; watermelons, pineapples, grapes are always available at your local grocery. But, these are foods you might never find growing in your part of the world and consuming them freely will lead to imbalances over time. This article has covered some basics regarding the Chinese medicine diet and the concept of dampness. Armed with this information alone, you can begin to make wise choices that will provide you with more years to your life and more life to your years. If you’re feeling inspired and want to eat according to the natural principles of balance discussed here, please read Chinese Medicine Foods to Eat and Chinese Medicine Sample Meals. These articles will help you make the switch to a harmonious way of eating and living.